Handmade in Honduras using a unique blend of Nicaraguan and Brazilian tobaccos, Al Capone cigarillos are infused with the savory flavors of Rum and Cognac. Available in both filtered and non-filtered versions, Al Capones are the perfect small smoke for lovers of bold flavor. I love these little cigars! They are slow burning, and have a sweetness to them. They are fresher here at BestCigarPrices than they are at some of my local shops. The Al Capone Sweets with filter are very mild with excellent flavor and I have received outstanding service from Best Cigars. Have been a repeat customer for many years. Great little cigar; mild taste and excellent flavor. An Al Capone Sweet is a lovely afternoon treat. Very well made little cigar. Al Capone Sweets Filtered have an excellent taste, always fresh, attractive appearance, and mild flavor. I gave up cigarettes, don't like pipes, and can't stand regular cigars. But these are the best thing I have ever smoked, I don't need to smoke a whole pack a day, I have cut down to 5 or so a day. I don't have the urge to smoke all the time. The smell of cigarettes makes me sick, but not the Al Capone Sweets Filter. I really like this little cigar. The taste is mild with a nice sweet cognac scent. I like the flip top box. I love these little cigarillos. I started buying them in the store when I "thought" by smoking cigars I would give up smoking...ha! I like them far better than I ever did cigarettes! I enjoyed the mild aroma and taste. This is perfect taste and blend to go with my evening glass of wine. Perfect smoke. Shopped around and Best Cigar had the best prices. Delivery was absolutely on time. Couldn't be happier. Al Capone sweets cognac filtered cigarillos. Thank you "Best Cigar Prices" for the 10 pack of Al Capones... Fast and easy. Best prices on the internet. Excellent little smoke, good flavor and slow burning for the perfect short smoke! I love these cigars. They are the perfect size when I don't have time for a big cigar. Al Capone cigars are high quality low cost cigars. I been smoking these for over 10 years, there are no substitutes. Love them,they are getting hard to find locally. These have a great taste and are a pleasant smoke. I have been smoking Al Capones and Villiger Sweets for about a year having switched from more than 2 packs of Marlboros and find that I can still enjoy some tabocco but smoke far less (about 5 per day). Both of these products are smooth and enjoyable! Very well done, light a great tasting. My husband loves these cigarillos. They are hard to find in retail businesses close to home. Travel 30 miles to purchase. Convenience of ordering online is great, and the price is better. Great little cigar. Sweet tasting, burns slow. Love these little things. Like the filtered better than the non filtered... nice sweet taste. Best prices I can find anywhere on this site as well. Nice and sweet and perfect size. I picked up a couple of these that had filters. They only cost me about a buck and I wanted to try them while on a long drive to the field. They're not bad, they are certainly sweet and the smell was bearable to those around me. I would like to try some more of these to really figure out the flavor. I couldn't tell the taste of 'cognac' or even a real brandy taste to it, but I might have to blame that on the filter. If you like smoking cigarette length cigars and mini cigarillos these are perfect. They smoke a little longer than cigarettes and the smoke is a bit creamy if you smoke it slow. Overall, not bad. 3-ish stars, good for every day if you like little smokes and like flavor. Delivered quickly with great customer service. 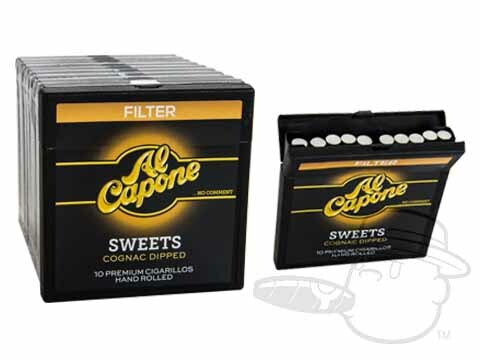 Al Capone Sweets Cognac Filtered is rated 4.4 out of 5 based on 58 customer ratings.